We’ve made the most magnificent eggs for you to find this Easter, each one containing something special - from bonus stamps to a year’s worth of coffee. 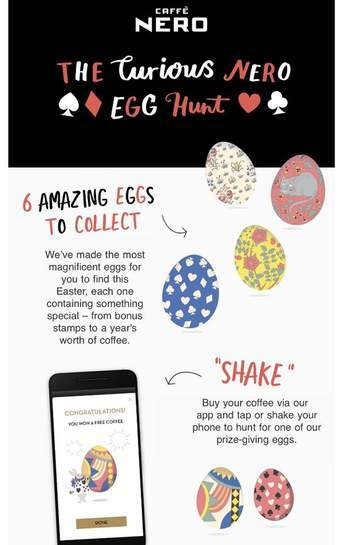 Shake your coffee via our app and tap or shake your phone to hunt for one of our prize-giving eggs. Got an e-mail about this too, very similar to the Christmas Crackers promotion they ran before Christmas. I can't seem to find a link to the T&C anywhere (where you should be able to see the prizes available etc). The promotion doesn't run for long this time, hopefully I'll be able to collect a few eggs. That's a shame, it's what I would've expected though, it was the same with the Christmas Cracker promotion. 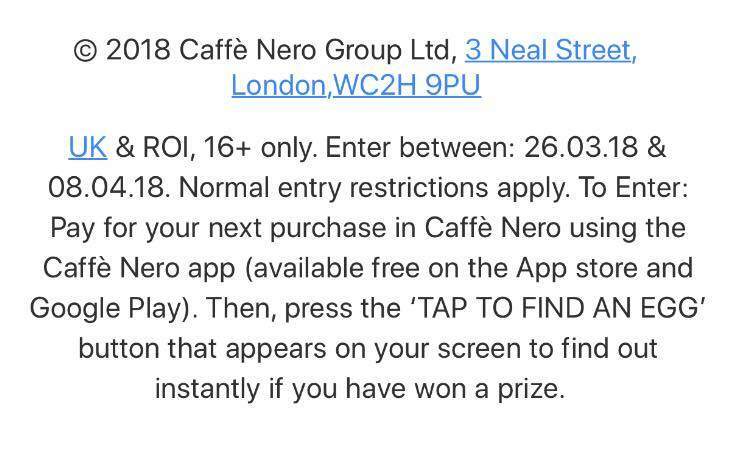 Would've been great to get the chance to win a prize with the free coffee.